Have you ever felt your eyes straining while you work on your computer at night? Has it ever come to your mind that you are not comfortable while looking at your screen? Your computer screen maybe okay to view when there is enough light in the surroundings, but in the dark, a bright screen hurts the eye. It is thus convenient to turn down the brightness according to the surrounding light. But brightness may not be the only factor responsible for effective optimized screen viewing; it’s also the color and the intensity of the display that matters. A display with rich colors and a high contrast will hurt your eyes and it takes quite a bit of time for our eyes to adjust to the light. Make your screen display adaptive to the surrounding light with f.lux. The software is available for Windows, Linux and Mac. Instead of changing screen brightness, f.lux changes the screen intensity color according to the time of the day and position of the sun. Using your System’s location setting (time zone) and surrounding lighting conditions, the application warms the colors on the screen and increases the percentage of redness. Red color has the least intensity in the light spectrum and is more comfortable to view. You can also set your location and lighting conditions manually. During the day, when the sun is up, f.lux sets normal colors and intensity levels for the screen, but as the sun goes down more, the screen takes up a reddish tin. At night, red colors are comparatively soothing to the eye, and so you can work without straining your eyes. So you can actually have a good sleep after several hours of late night work. – Small, lightweight application (under 1 MB installer size). – Automatically adjust screen color and intensity according to time of day. – Automatically fetch your location using your network information: When you manually set the location, f.lux will open up a browser page. You will be prompted to allow it to access your network location. – Set the lighting condition according to your room manually or automatically. 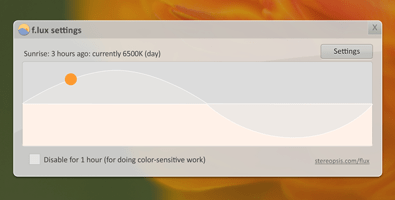 – Temporarily disable f.lux when doing color-sensitive work. F.lux is also available for iOS though it requires you to jailbreak the device to install it.